♥︎ Bree wears a blue chambray dress layered with white and navy striped cotton, and finished with mother of pearl buttons. 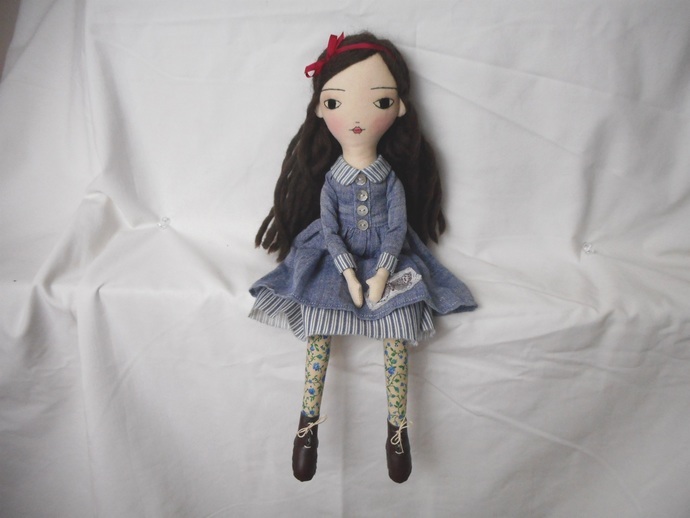 She has blue and beige floral tights and wears hand-stitched brown ankle boots. 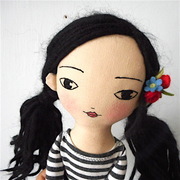 Her hair is dark brown, made from 100% wool yarn, left long and tied with a pretty red ribbon. Her body is 100% cotton with jointed limbs making her pose-able when propped in a sitting position. Her face is embroidered and tinted with wax and coloured pencil crayon. 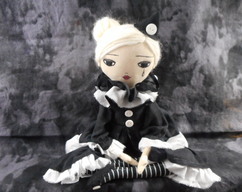 Her hair and clothing are stitched in place. Audrey is about 40cm tall. 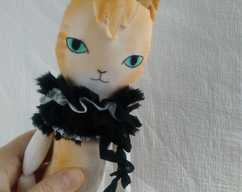 ♥︎ Made for grown-ups who have not outgrown their love of dolls. Ships within 3 days. 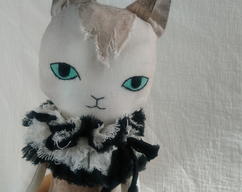 ★Price includes shipping with tracking within Canada and the US. Handcrafted with joy in Ontario, Canada.